Episode 120: What do You do if Your Leadership Doesn’t Buy into Inbound? For all of the companies out there dedicated to being inbound organizations and helping their customers succeed, there are ten more who aren’t. It is not uncommon for inbound to enter an organization through the marketing or sales department first. This means that often the first hurdle to becoming an inbound organization is getting leadership buy-in. [0:43] Question: What do You do if Your Leadership Doesn’t Buy into Inbound? Education is often the first step on the road to becoming an inbound organization. The sales or marketing department (or even just one of two people internally) are faced with the task of educating leadership and selling inbound internally. 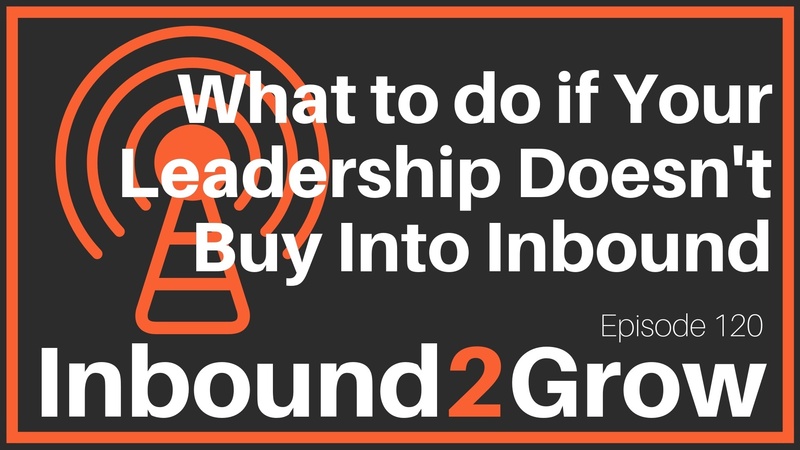 Understanding what inbound means and the changes that precipitated it are key steps to securing leadership buy-in. One of these changes includes increased competition, a fact that most leadership is keenly aware of. Most companies today have more competition than they did in years past, and buyers find that competition faster than ever before. With the internet at their fingertips, buyers are empowered to educate themselves and discover options like they never were in the past. This has fundamentally changed the buyers and the buying process itself, which is something many leaders don’t believe. Or, rather, they don’t believe it of their buyers, although they might admit it’s true of buyers in other industries. For older, larger companies it is not uncommon for leadership to persist in this belief that their buyers are the exception to this change. Often, they are still enjoying success and growth, so why should they believe that their buyers have changed? Unfortunately, the more time goes by the harder and harder it is to maintain previous levels of growth and success. So, how do you convince leadership that their buyers have changed, they face more competition, and the answer is to adapt and adopt inbound? The first step, as we said above, is education. Get your leadership team the resources they need to learn about inbound. There are plenty of books out there (you can find links to some of our favorite in the Links section of this post), but a quick google search for inbound + your industry should return any number of industry-specific articles and resources. Once you’ve secured some tentative buy-in, you can begin exploring other avenues like reaching out to an advisor or consultant. We also recommend taking the Inbound Organization Assessment on our website to see where your weaknesses are and where you can improve. Ultimately the goal is to get buy-in from all departments, not just leadership, and begin creating MSPOTs, Culture Codes, Inbound Operating Systems, and becoming an inbound organization. Leaderships support makes that much easier, however. Inbound is a pivot point. Yes, this is how your customers think, and yes, you do need to change. Every week you don’t become inbound your competition is, and they are getting farther ahead and reaping the rewards. It’s not necessarily about how much you spend; it’s about how strategic you are. Here are three steps you can take to begin the process of convincing your leadership to buy into inbound. Tell a story – Show specific results and tell the story of where you are and where you could be. Bonus points if you can hold up a competitor as practicing inbound. Get sales buy-in – If you can get sales to buy in, it helps convince leadership of the potential of inbound. Run tests – Test a campaign or piece of content and use the results to prove the efficacy of inbound internally. Are you enjoying the podcast? Did you read Inbound Organization? Taking a quick moment to rate and review Inbound2Grow and Inbound Organization on whatever service you use is the best way to let us know how we’re doing. Your ratings and reviews make a big difference, and we appreciate you taking the time to provide your feedback.